The United States is often criticised for using up 25% of the world's resources while comprising only 5% of its population. In fact, America contributes substantially to global growth through its contributions in terms of scientific research and development and education of foreign-born scientists. 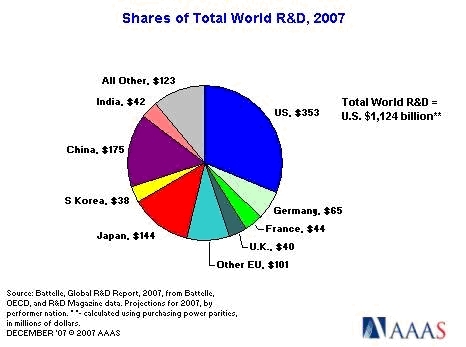 In 2007, America provided $353 billion in R&D funding, out of a world total of $1.1 trillion. This compares to $65 billion from Germany, $44 billion from France and $40 billion from the UK. Private funding for R&D overtook government funding in the late 1970s and has vastly increased the amount of funding available. 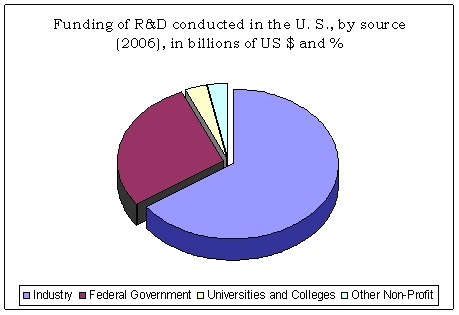 In 2006, 65% of US R&D funding was provided by industry. The top four spending companies are all American Pfizer, Ford Motor, Johnson & Johnson and Microsoft. 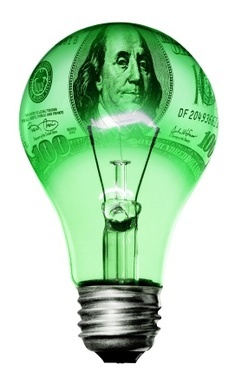 Together, those four companies spend almost $15 billion on R&D. In 2003, the US produced over 200,000 articles in major scientific and engineering journals. The National Science Foundation found that "U.S. institutions were at least partially responsible for half of the world's influential articles; no other major publishing center approached this figure. Moreover, compared with other major publishing centers, a considerably higher percentage of total U.S. output was classified as influential. In 2006, US academic institutions were home to over 142,000 postgraduate students in science and engineering fields, and increase of 45 percent since 1996. In addition, the number of foreign postdoctoral students in science and engineering is greater than that of US citizens and permanent residents, by 20,778 to 14,035. There are over 3.3 million foreign-born scientists working in the United States. Of these, 56% are from Asia and 5% each from Africa, South America and the Caribbean. 56 Americans have won the Nobel Prize for Chemistry, 87 Americans have won the Nobel Prize for Medicine and 64 Americans have won the Nobel Prize for Physics. The relatively new Nobel Prize for Economic Sciences, which began in 1969, has been awarded to an American 35 times.